. This game was made for the shmup-dev.com competition Round k2. It is coded in C++ using the Dev-C++ IDE. It uses Irrlicht for rendering and irrKlang as sound library. resources from it without express permission. e-mail if you have something you'd like to say.
. 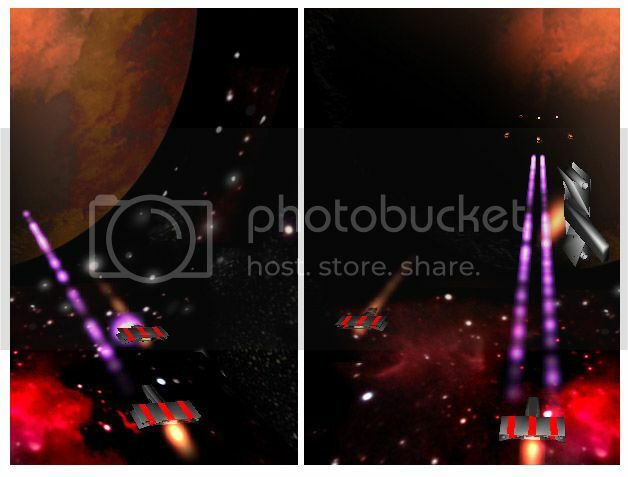 This version of the game was rushed to meet the deadline of the shmup-dev.com competiton Round K2. It is not finished work.
. Use the arrow keys to move.
. Press <X> to select (menu) or to shoot (while playing).
. Press <C> to pause/unpause the game.
. Press <Esc> to destroy your own ship.
. Surviving. About 60 points per second. Twice that if your option orb is in green mode (see below).
. Destroying an enemy ship. 1000 points.
. Hitting a boss. 100 points. Your ship is not like everyone else's. After years of research, you have managed to build a so called 'energy satellite'. You like calling it 'Divus'. Divus is a small artifact, which rotates around your ship. It is non-material, all energy, and its main function is making your ship's firepower go beyond that of any other ship of its kind. Divus consumes part of its energy when shooting, since it gives your bullets this extra energy blast.
. Purple mode. This is Divus' normal mode. Your firepower will be bigger than that of any other ship of your kind. but it's temporary and instable. Being hit when on this mode makes the system restart and go back to purple mode. It is because of Divus that you will feel superior to other ships when on the battlefield. It is because of you that Divus exists. During the battle, your ship's shield system gets damaged, as that of any other ship. However, you can increase your shield level by picking shield powerups. Shield powerups are easily recognizable. They are red and look like rapidly moving small particles.
. The small ones will recover 40% of your shield level. There appear sometimes, after destroying a ship.
. The big ones will recover 100% of your shield level. They are not that common as the small ones. On the top-left zone of the screen you will be able to see an image representing Divus' current mode. If on green mode, you will see a bar that indicates how much time is left until it will go back to purple mode. turn into green mode to use that extra energy that could make it unstable. The top-right zone is used for bosses shield bars. Make those go down.
. Programming by Borja Moreno Fernández "BMF".
. 2D art by Tor-Erik Lindstrøm "Razor".
. 3D art by Christian Clavet.
. Music by Theo Keeler "Flashback".
. Design by Borja Moreno Fernández "BMF" and Tor-Erik Lindstøm "Razor".
. All the people at the shmup-dev.com forums, for their always wise advice.
. All the people at the Irrlicht forums, for their tips and coding help. Thanks in particular to Travis Vitek.
. All the people who tried the game during the development stage, for their feedback and motivation.
. Juan Antonio Cano Salado "Jacano", for his help concerning the online highscore system.
. "Xemrel", for his hosting and general help.
. "Serrellious", for founding the community which helped me find great people, and increase my skills.
. To you, for downloading and playing the game. I can see that the ships operate on one plane, but I think that motorherp might have his doubts. 3d graphics are fine, but the gameplay must be 2d. The reason rail shooters are not included is not because they have 3d graphics but because the actual gameplay takes place in a 3 dimensional environment were movement can be in all 3 axes. This distinguishes this style of gameplay from shmups which is what this competition is about. If you want to play around with the camera that is fine, but your gameplay must remain 2 dimensional. Please just try to accept the competition for what it is and appreciate the focus we are trying to give it. Ok seems people are still struggling on this point. I havn't played Hyper Invader yet but judging from the screen shots this is a very interesting example as it falls very borderline for me. From the appearence they've tried to keep the gameplay of shmups by restricting the actual gameplay to one plane, i.e. 2 dimensions, even though the graphics are 3d. This is good. Personally I think the tilt on the camera is a little too much and the perspective is distracting. Had it been in development for the competition I would have suggested they straightened the camera up a bit to a more overhead view, but ultimately I would have let this pass. If however the camera was positioned in a just above cockpit position looking down the nose of the ship this would have been too far. Also if the game mechanics were extended into the 3rd dimension then this would definately be a no no. Ultimately it comes down to this. Its not possible for me, and neither am I going to try to create clear cut rules for every conceivable situation and then try and enforce them to the letter. In the end its down to you to use your common sense and judjement to create a game within the spirit of shmups using the guidelines I've given. If you think what you're doing will get you disqualified then its probably a good idea to reconsider it. So, I don't know, maybe you should PM him. Well, the gameplay is 2D. So there should be no problem with that. After all, it plays like any 2D shmup, basically. I think it's time for a playable version! I want to get some feedback already. Lets see who gets highest on that highscores list. Yes? Ha! -Z for calling allies (only if your yellow bar is full or it has turned green). -Arrow keys to move around options. -Space bar to select, go back, mostly everything. Video! It's me playing the game. Captured using Fraps. Compressed using Bink and Smacker. It's 320x240, even though the game is 640x480. I didn't want you to need to download a huge file. In case you prefer a 640x480 video, here it is! It's a different one. About 8MB. There you go, get the feeling! 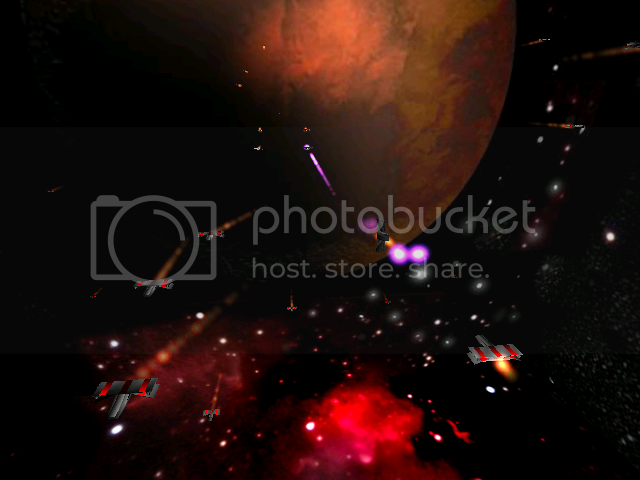 So, being at Razor's house, playing around with the Irrlicht engine, we decided to make a space shooter. Seeing how a few guys we know were entering this competition, we thought we may as well do so! And, after 3 days of work, we are proud to announce... a couple of screenshots! 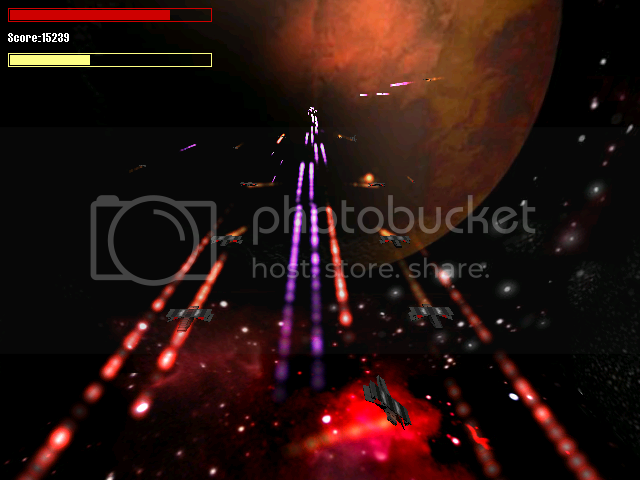 ARMADA is a 3D game with 2D gameplay, in which you take control of a ship in the middle of an interplanetary war. We'll be giving more details about the story later, or maybe not. 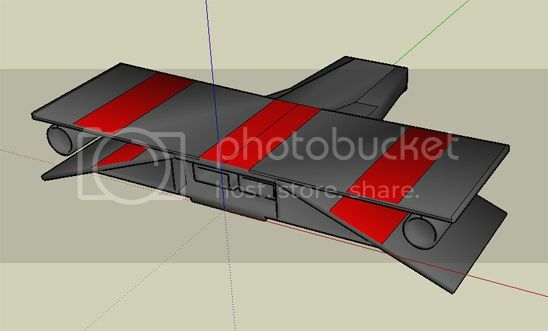 So, here you have a screenshot of our current ship model, made by Razor. And here you have a couple of in-game screenshots. Yay for particle effects. Hope to keep working on this as much as we have until now! Then it's definitely not disqualified. Also, it was rather stupid of me to suggest PMing motorherp when he could just read the thread. An interplanetary war is taking place. As a member of the army of one of the factions involved, you are into the war field. So this won't be the classic me VS all shmup game. As it's war, you should feel like if it really was war. Even though the gameplay is 2D, and you can only take care of a limited area on screen, there will be fight going on everywhere else. AI controlled enemies flying below, above and to your sides, shooting AI controlled enemies, for an intense action feeling. Options fit perfectly into this environment. We are thinking, for example, on a 'charisma' meter. The more enemies you defeat, the more your allies will be willing to help you, meaning that once your bar is full, you could call allies to come and help you with your area. This idea gets deeper considering how your bar can be filled several times (without being used), and each time you'll be able to call for stronger allies. Adding 3D sound using IrrKlang, more enemies and weapons, AI controlled fights surronding you, and creating/improving ships models and textures. That's all for now. We'll keep you updated! This is one of my most anticipated games from this comp, along with Prototype 2 and Droneswarm Good luck BMF and Razor! 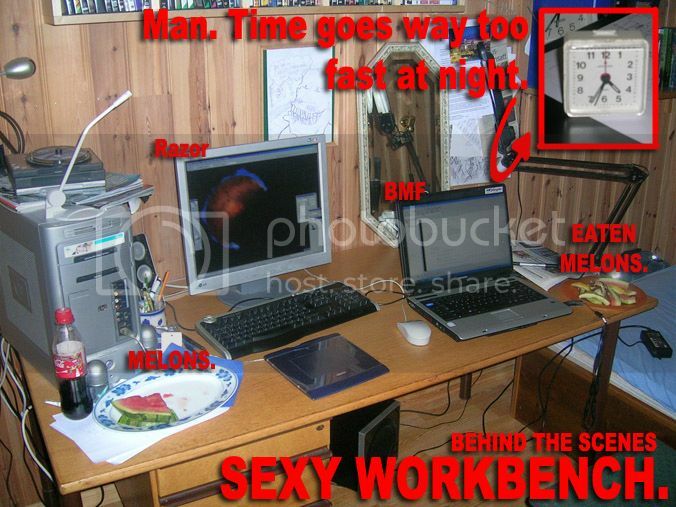 Also notice how my monitor is way bigger than BMF's. Size matters." Hello people, here you get a new screenshot. We haven't modified the models and textures for ships yet, but we are progressing at good pace. After all, today, it's been a week of development! Currently, there's only one type of bullets, but that is definitely going to change. There will be powerups too, one (or more) of them concerning fire power (with different bullets?). There are now (as you can probably see in the screenshot) enemies all around the 'world' (not only in the range you can move), these are part of the war-feeling we want to give to the game. There will as well be allies there, and shots and explosions outside your move-zone should be a plus for immersion into the game. I started working on the menu too. There are currently 3 different kind of enemies (all with the same model and texture, I'm talking about behaviour here). A few effects have been added too, such as 3D sound in explosions, and camera shaking when being hit. Enemies aren't created randomly anymore, but in 'formations'. There will be dozens of those. Levels basically just be a succession of 'formations' (each having from 4 to 10 enemies more or less) plus maybe a boss at the end. I have kept working hard for the last couple of days, doing some big improvements. Firstly, the main menu is functional now (still to get prettier, and options and highscores are not done yet), enemies can shoot, and so do environment enemies and allies, it's quite a mess of shots everywhere, war atmosphere! We started working on the HUD too (which will totally be updated soon, with the final one, hopefully), and added the 'charisma' meter, that when full, allows you to call allies (options) to help. These are working already, and it's great to see they do the job for you, heh. We have been doing lots of design work too. And here you get a new screenshot, will keep you updated! Show general stats for Xemrel. You decided to join, afterall! Yay! Re: Armada - Video inside! Re: Armada - 2 Videos inside! Wow the movie looks way better then the screenies. It can even be twisted and contorted by all manner of formulae. Like in Space Giraffe. And I like the 3D look. @the2bears: I think it adds to the game! But you'll see! The atmosphere created by the 3D environment is better imo, you get to see enemies from far away, with no limitation than how far your view can distinguish things... I like it. The main things of the game are done by now, it's a matter of polishing now. We have to add more levels (I finished a separate tool that we'll be using as a level editor), enemy models, weapons, and improve everything we can. We've added online highscores too, but that still needs to be bug-freed. Menu has been done, with it's settings and all functioning already. Hope to have a playable version soon! And hope to meet the deadline! Re: Armada - Playable version & 2 Videos inside! Not bad, actually quite nicely done and enjoyable because it's different. The game's still in quite an early stage of development, and we'll be working on adding more levels, weapons, powerups, enemy models, etc. now. Also, any kind of feedback is appreciated! But beating my high score by 1 point... Thats just insulting. Currently: Working on levels (plan: 5 levels [each twice as long as current one] with a final boss each, and a different skybox each, as a start). The game now has 5 levels and 5 skyboxes, one per level, and is going to have 5 bosses (plus the final one on a special level? ), the HUD has been redone (much better now! ), and the online highscore table (a different one, so we'll be keeping the beta records) is now hacker-safe (to an extent, anyways) =). Many other minor improvements have been made, and the controls have switched to Z,X (instead of Space bar, Z), which is much more comfortable. We'll worry about AZERTY guys later. There may or may not be a new release soon, depending on if we feel like we need feedback on certain subjects. Cool ship! It looks like a combination of the original and an X-Wing. Yeh, he used the original as a reference, as you can see. I liked the responsiveness of the ship. I think you might look into some splines for enemy movement as sudden direction changes are a bit frusterating. The game moves in a very linear fashion and personally I believe that some angled shots would be nice. The speed of the shots could be slowed down a bit aswell, to compinsate for the camera angle. There's a weird bug. Every once in a while, when I summon my options, a gigantic untextured model fills 3/4 of the screen and wiggles around before disappearing. I can see all of the ships that are behind(?) it, but it looks extremely odd. Yeh, I found and fixed that bug a few days ago, Shoot-em-upper. Here you get a new screenshot. It's a boss (ships are actually coming out of it). Its healthbar is temporary. Looooookin Good sir! More eye candy!!! Oh yah, that's COMMANDER Matt McFarland to you!!!! I love online scorin systems Bring'it!! Wow, it looks so much better! Also those enemy ships look exactly like a doodle that I did a few years ago. Inspired by the TIE fighter, perhaps? @ Matt McFarland: Hehe, thanks! You'll have to try harder if you want to keep on the top 10 for long though.